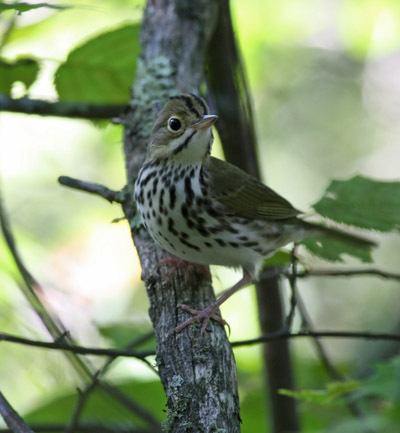 One bird that is difficult to find and see is the Ovenbird. In the summer their song can be heard from the depths of the woods as they sing their distinctive “teacher, teacher, TEACHER song. Most times only their singing will be heard and the bird won’t come out of hiding. They are definite skulkers creeping around on the forest floor and rarely going up in the trees. But sometimes in the fall, they’ll be a little more bold, and perhaps even come out for some photographs. This bird was attracted to the sound of the shutter on my camera. And they are one of the Warblers that don’t molt into a basic (winter) plumage. 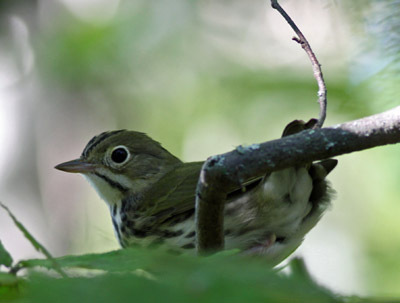 Here the Ovenbird has struck a classic Warbler pose as he peers under the leaves for insects. 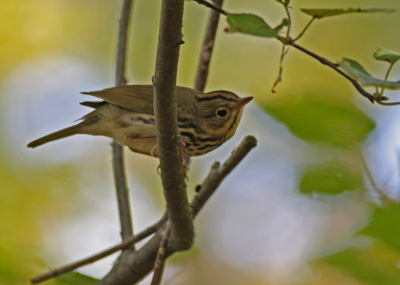 You can see the orange stripe that is on top of the Ovenbird’s head. This entry was posted in Crane Lake Area. Bookmark the permalink. Thank God there is one fall warbler that won’t give me fits!